H.E. Sheikh Fahad Bin Mohammad Bin Jabor Al-Thani, Chairman of Doha Bank, announced that the Ordinary General Assembly of the Shareholders in its meeting held on 07 March 2018 endorsed the Board of Directors’ corporate Governance report for year 2017 and the balance sheet and profit & loss account for the financial year ended on 31/12/2017 and also endorsed the Board's recommendation to distribute cash dividends of QR 3 per share to the shareholders. During the same meeting, H.E. the Chairman and Board members were discharged from the responsibility for the year 2017 and their remunerations were determined. 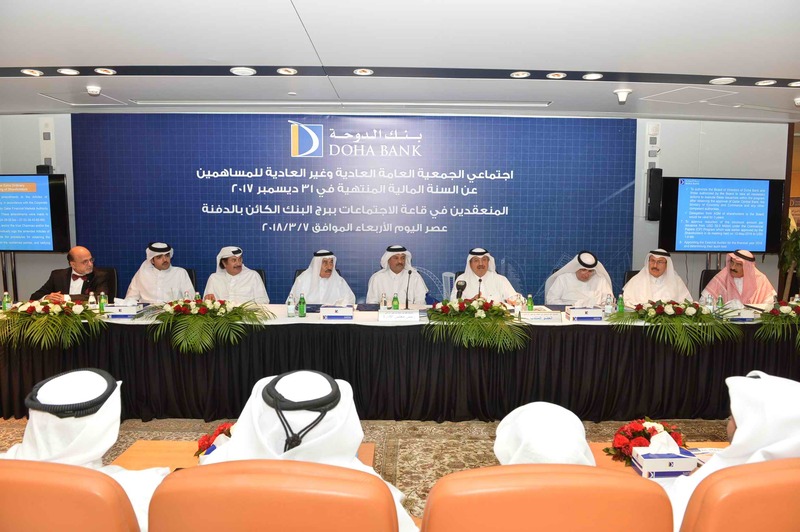 His Excellency also stated that the AGM has agreed for Doha Bank to issue Debt Notes “Bonds” using Doha Bank EMTN programme within the main components shown in the agenda and agreed to reduce the minimum amount per issuance under the commercial papers programme from US$ 50 Mn to US$ 1Mn. AGM has also appointed KPMG to audit Doha Bank’s accounts for the year 2018. He also stated that the EGM has endorsed the amendments on the Articles of Association of the Bank in accordance with Corporate Governance code issued by Qatar Financial Markets Authority and Qatar Central Bank and authorized the Chairman and/or the Vice Chairman and/or the Managing Director to individually sign the amended Articles of Association and complete the procedures for obtaining the necessary approvals from the concerned parties, and ratifying the authorization. H.E. Sheikh Fahad Bin Mohammad Bin Jabor Al-Thani extended his sincere thanks and gratitude to the Board members and Executive Management for their efforts and achievements during the year and to the shareholders, representatives of the supervisory authorities in the State of Qatar and the auditors and wished them all the success and prosperity.